Yes, folks! Christmas in February! 1. A one-layer card is defined as a single layer of cardstock folded in half. No other layers allowed. 2. Make a Christmas (or Season's Greetings, if you prefer) card, but you must use green and red on white or cream. Feel free to be creative with the shades of green and red...you don't have to stay traditional. You can also use natural-style cardstock, watercolor paper, or textured paper as long as it's white or cream. Keep embellishments to a minimum. Extra points if you do like I did and use an image that isn't specifically holiday! Sorry, folks. This is my best effort for this week's challenge. It was either this or nothing. It was time to move on to something more rewarding. Thanks, as always, for peeking! oh... your card is so sweet! Wonderful "effort"! I love it! You did it again! Came up with an elegant card inspite of not having all of your tools to play with. Lovely card. Cute card even though it was a little frustrating. Know what you mean about those $1 stamps. I certainly have had better luck with the wooden block $1 stamps than the clear ones. Keep posting your creations. I like seeing what you are up to. I feel your pain. I really struggled with the challenge this week. My biggest challenge is stamping with "color". I can color an image with the best of them, but I just can't seem to get the hang of stamping in a color. I think this turned out really cute. Glad you didn't give up on it! I know what you mean Carol! I had a similar experience except that I can't blame it on the stamps! 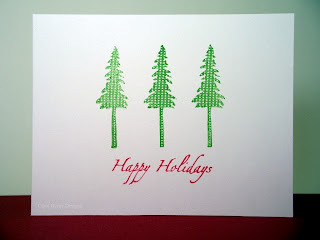 I think these trees are cute and they are very evenly spaced and placed! Not a bad card at all! Lovely positioning on the trees - very clean and simple. Lovely! Bonnie, you have NOTHING to apologize for. The card is wonderful...despite the frustrations to get to it. That's why I finally decided to never again buy a clear stamp that wasn't photopolymer. It'll be easier when you get all your stuff back, but you are NOT alone in having a trash can full of rejects!